Long, textured layers fall to mid back in this full, flowy design. A favorite choice for those seeking a glamourous hairstyle with volume!. Overall length 27 inches. Shown here in Paprika. 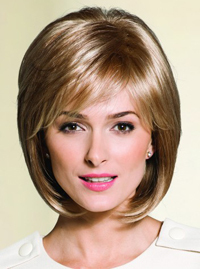 Collared length wig with layered flip and textured edges. Colour shown Creamy Blond (main image) and Cappucino Highlight (small image). Length at the nape is 15cm. Now available in 'Gradient Colour' (G)! 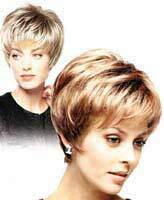 Semi- wedge bob with tapered back. Length at the nape is 5cm. Can be re-styled to suit you. Colour shown is Light Chocolate (main image) and Sunny Blond (small image). Now available in 'Gradient Colour' (G)! Beautifully styled to Noriko's very high standard in a breezy modern feathered layer-cut. Monofilament construction. Fringe 4", length at crown 5", length at nape 3.5". Colour shown: Spring Honey. Now available in 'Gradient Colour' (G)! Beautifully styled to Noriko's very high standard in a breezy modern feathered layer-cut. Fringe 4", length at crown 5", length at nape 3.5". Colours shown: Top: Burgundy Rosa, Bottom: Nutmeg-F(G). Now available in 'Gradient Colour' (G)! Unique trendy style with a flirt edge. Colour shown is Chocolate swirl. 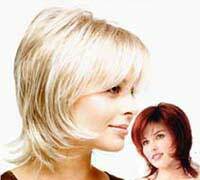 Long Soft layers with great movement. 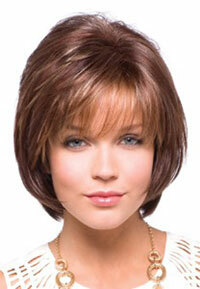 Rene of Paris Amore Kelly Medium Wig is coming to the end of the line and is being offered at a Special Offer Price . Kourtney is a 'must have wig for your collection'. It has has retro like layers to create a femininity and infinate style versatillity. Colour Shown: Java Frost Head Size: Average, Crown: 9 " (23 cm), Fringe: 5.25" (13.5cm), Nape: 7.75" (19.7cm), Weight: 3.4oz (96g). Carrie. 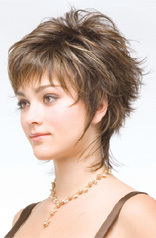 A tousled curly style that falls just below the shoulders with a soft face framing fringe. A lovely mix of curls. Crown 10.5 Inches Fringe 7 Inches Nape 7.5 Inches Weight 5 Ounces Length Medium Colour Showing Mochaccino R.
Jolie. A modern bob with perfect layers, texture and volume. Crown 5.5 Inches Fringe 5.5 Inches Nape 4 Inches Weight 3.2 Ounces Length Medium Colour Showing Nutmeg F.
Robin. A graduated layered style creates a soft silhouette with a wispy fringe. Crown 17.5 Inches Fringe 4.4 Inches Nape 17.6 Inches Weight 4.9 Ounces Length Long Colour Showing Dark Chocolate. Amal Shaggy bob with loose, romantic curls and a soft layered fringe. Crown 10.3 Inches Fringe 7.5 Inches Nape 4.2 Inches Weight 3.6 Ounces Length Medium Colour Showing Main Image: Coffee Latte. 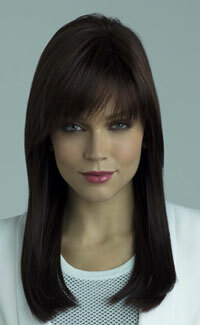 Kendall Multi textured layered cut gives this style its versatility. Crown 7.5 Inches Fringe 7.5 Inches Nape 7.25 Inches Weight 4.1 Ounces Length Medium Colour Showing Marble Brown. Cameron. 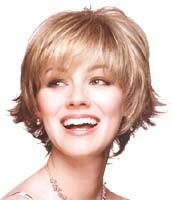 Casual movement characterizes this irresistible bob. Crown 6.5 Inches Fringe 5 Inches Nape 4 Inches Weight 3.1 Ounces Length Short Colour Showing Sugar Cane.